Yes, ladies & gentlemen, it's AGM time! 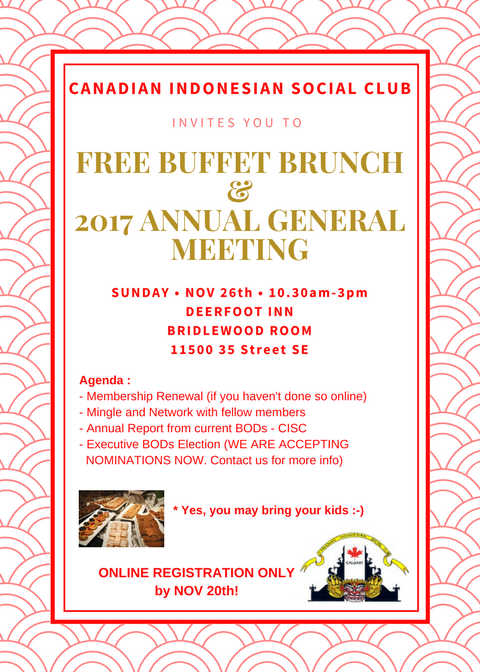 Come and join us for a FREE BUFFET BRUNCH, followed by 2017 ANNUAL GENERAL MEETING. Scrumptious brunch + mingle with fellow members = AWESOME TIME! And this year, we're gonna have Executive BODs Election. So, if you know somebody who is passionate about Indonesia and would like to contribute to this club, please, nominate him/her. Sssshhh....It's a top secret, but we already have a couple of candidates. So expect the unexpected, guys! This AGM is gonna be DIFFERENT! ONLINE REGISTRATION ONLY by NOV 20th. So, bring your whole family & let's have a good time! Remember to put all names of your family member in guest section when registering online.